This tutorial covers a comprehensive workflow for filtering variants based on public annotations data, classifying variants according to position relative to a gene transcript, classifying variants according to the variants’ effect on the amino acid sequence, and visualizing variants of interest. To complete this tutorial you will need to download and unzip the following file, which includes a starter project that contains data from public 1000 Genomes Phase3 sample sequence data, as well as simulated phenotype information. 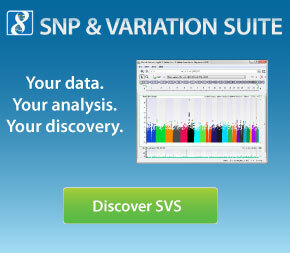 You will also need to download and install the add-on script Activate Variants by Genotype Count Threshold which you can find on our scripts repository web page along with instructions for installing in the appropriate directory for use in SVS.